Whilst Armistice Day is commemorated every year at the eleventh hour of the eleventh day of the eleventh month to mark the time the First World War officially came to an end in 1918, it is Remembrance Sunday that South Africans and other Commonwealth nations honour those members of their armed forces who not only lost their lives during the First World War, but in all instances of conflict. 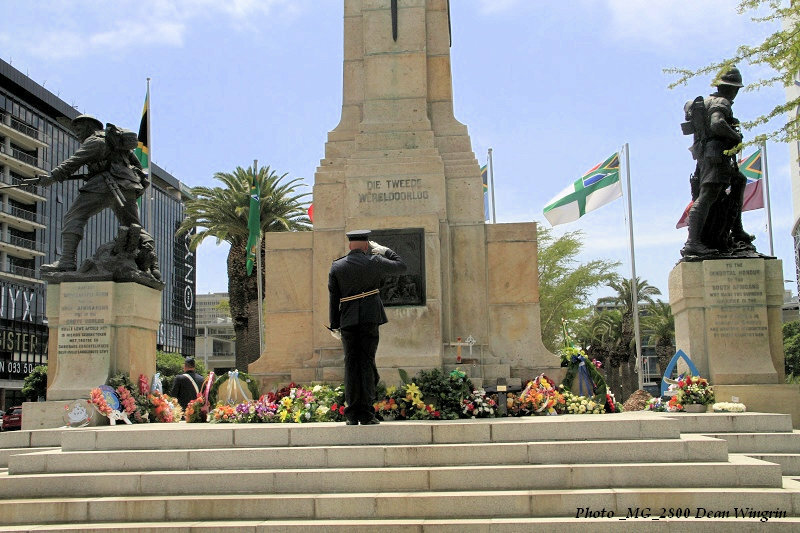 As per tradition, The City of Cape Town hosted the 2017 Remembrance Day memorial service and wreath laying ceremony in front of the Cenotaph in Adderley Street, Cape Town. 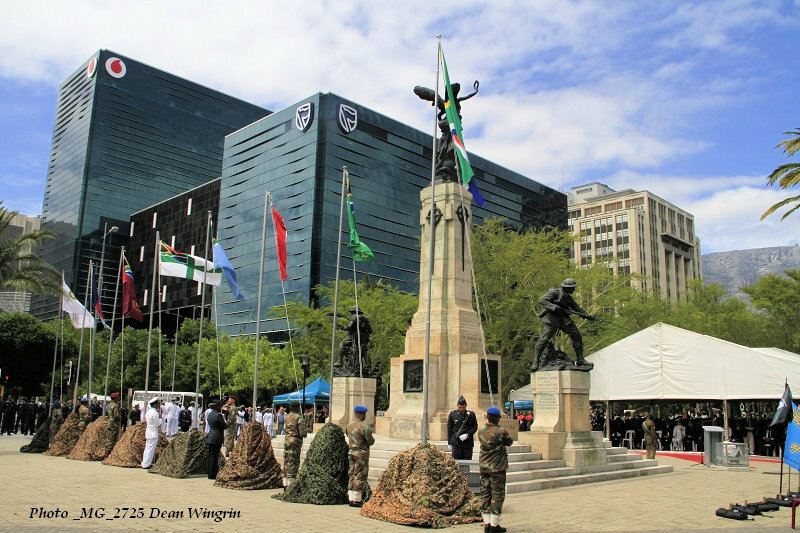 This year marks the 99th anniversary of the end of World War I and on Sunday November 12, 2017 a large number of City of Cape Town, South African National Defence Force (SANDF) and veteran units and organisations, as well as representatives of the foreign Diplomatic Corp, layed approximately 70 wreaths. 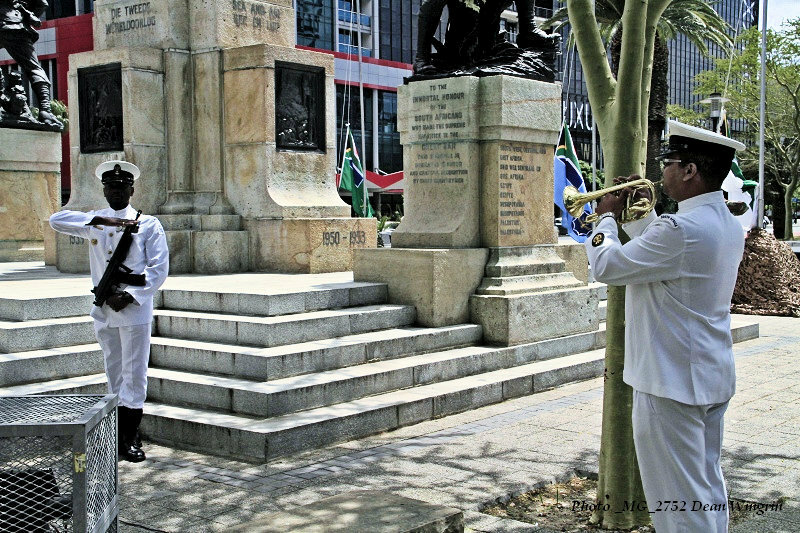 The wreath-laying ceremony was preceded by the traditional poignant sounding of the last post by a single bugler of the SA Navy Band and two minutes silence. The first minute is a time of thanksgiving for those who had returned alive, whilst the second minute is to remember the fallen. The bugler then played Reveille to signal the end of the silence. Two salvos of ear-splitting blasts were also fired by the GV1 25-pounder ceremonial guns of the Cape Field Artillery. 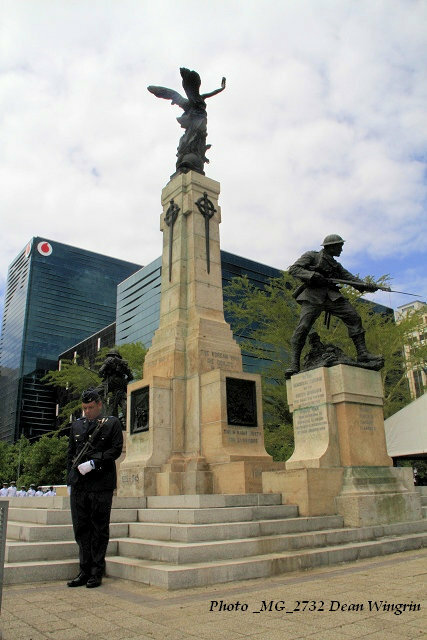 Not many people know that the two-minute silence observed as part of Armistice/Remembrance Day ceremonies in the UK and Commonwealth countries actually originates in Cape Town when the then Cape Town Mayor started the tradition in May 1918 where it was initiated by the daily firing of the noon day gun on Signal Hill. Sir Percy Fitzpatrick, writing to Lord Milner in November 1919 described the silence that fell on the city during this daily ritual and proposed that this became an official part of the annual service on Armistice Day. 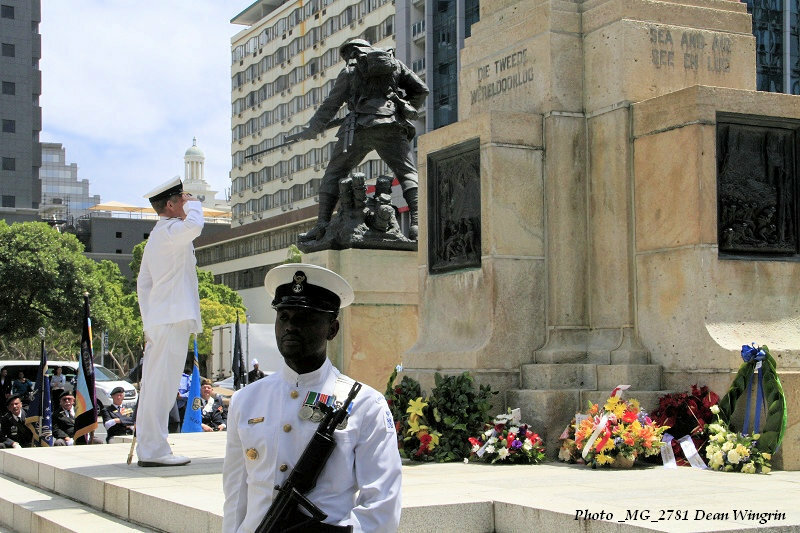 The suggestion was reviewed and accepted by the British War Cabinet and was immediately approved by King George V.
Guest of honour was Executive Deputy Mayor, Alderman Ian Neilson, with Rear Admiral Guy Jamieson, Deputy Chief of the SA Navy, representing the Chief of the SANDF. 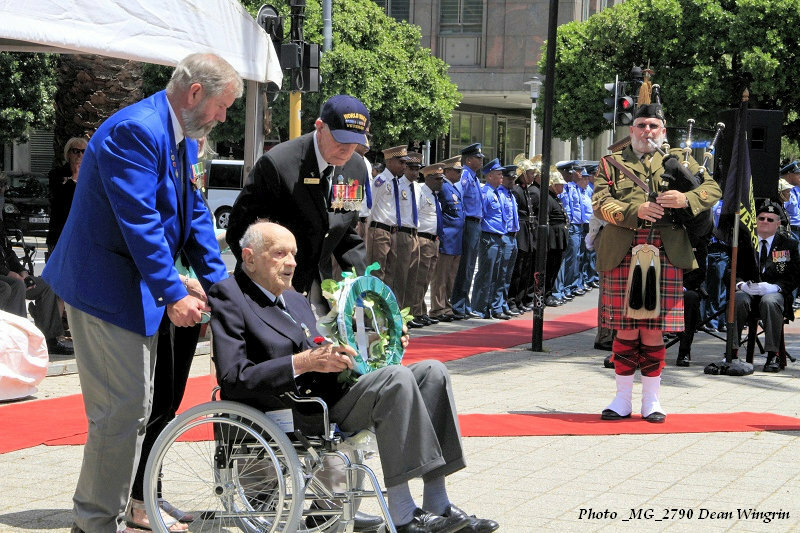 Three veterans in their 90’s layed wreaths, including a sprightly 99-year old Sergeant Sidney Ireland, on behalf of the Third Brigade Signal Company Reunion association. Along with the laying of the wreaths, all guests were provide with a paper poppy, a symbol of remembrance and a reminder of the blood spilt on battle-torn fields. 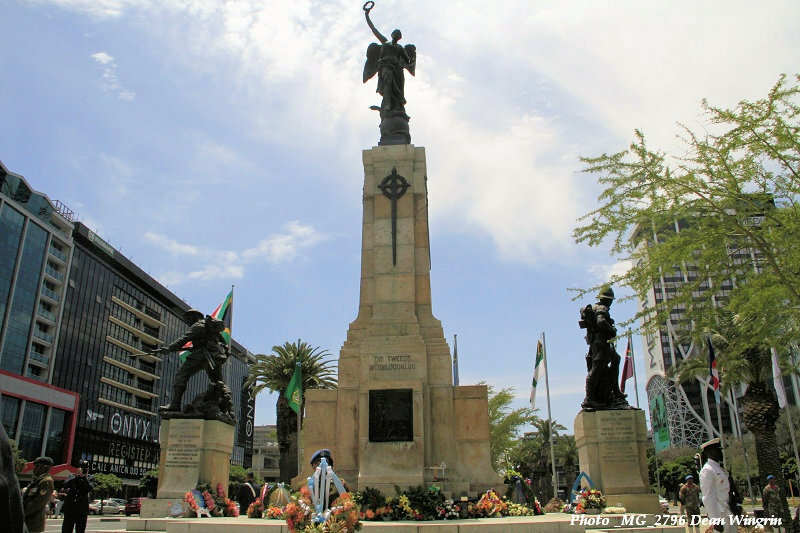 Tying in with the Remembrance Day Service, a wreath laying ceremony was held at the Red Cross War Memorial Children’s Hospital in Rondebosch, Cape Town on the preceding Friday in commemoration of the World War II ex-servicemen who founded the famous hospital. Built in 1956, the Red Cross War Memorial Children's Hospital is the largest, stand-alone tertiary hospital dedicated entirely to child healthcare in Southern Africa and was built through public subscription as a memorial to soldiers lost in the Second World War. 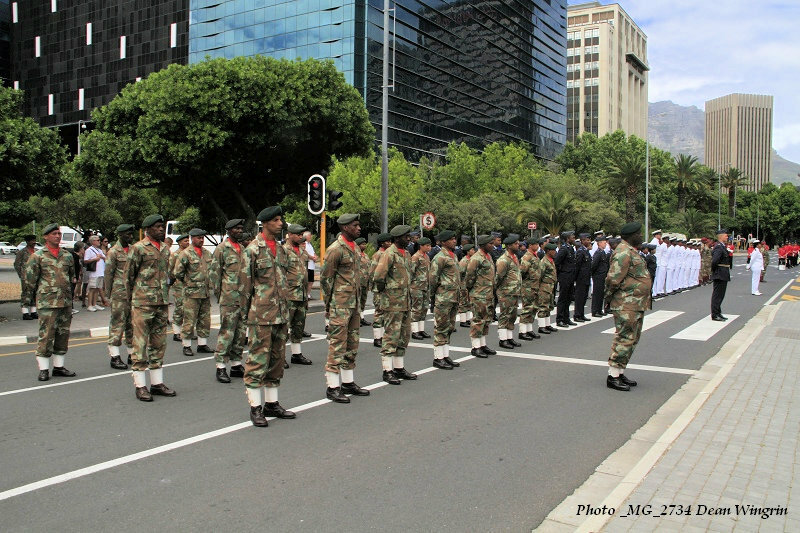 SANDF units participating in the Remembrance Day memorial service included 9 South African Infantry Battalion, Cape Field Artillery, Signal Unit WC and Army Support Base Western Cape, members of AFB Ysterplaat and Naval Base Simon’s Town. 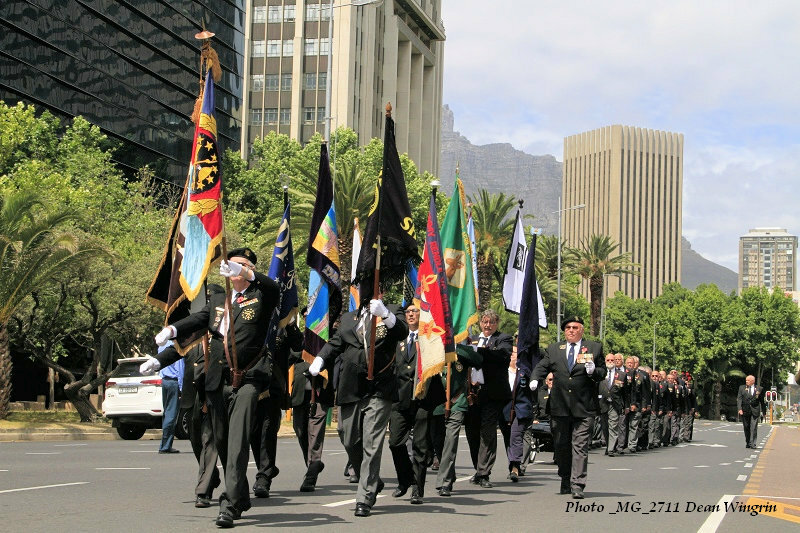 Support was provided by the SA Army Military Police, 3 Medical Battalion and AMHU Western Cape. 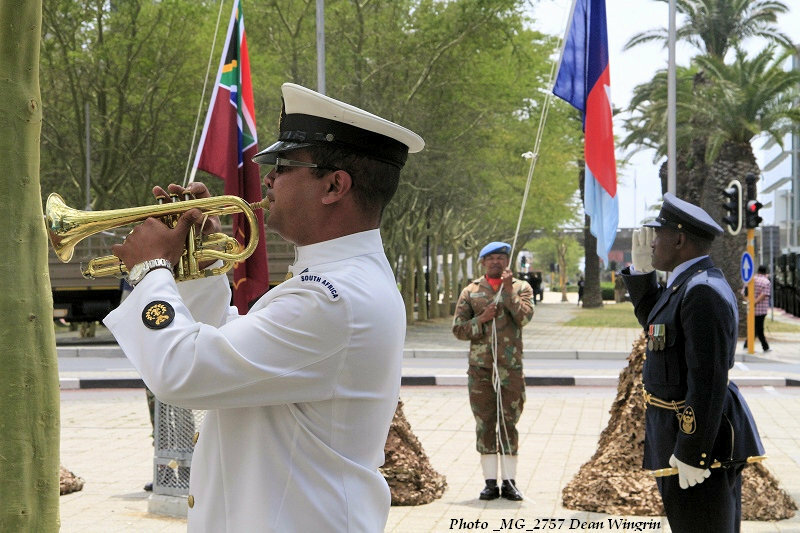 Participating band were the Cape Field Artillery Band and the SA Navy Band. 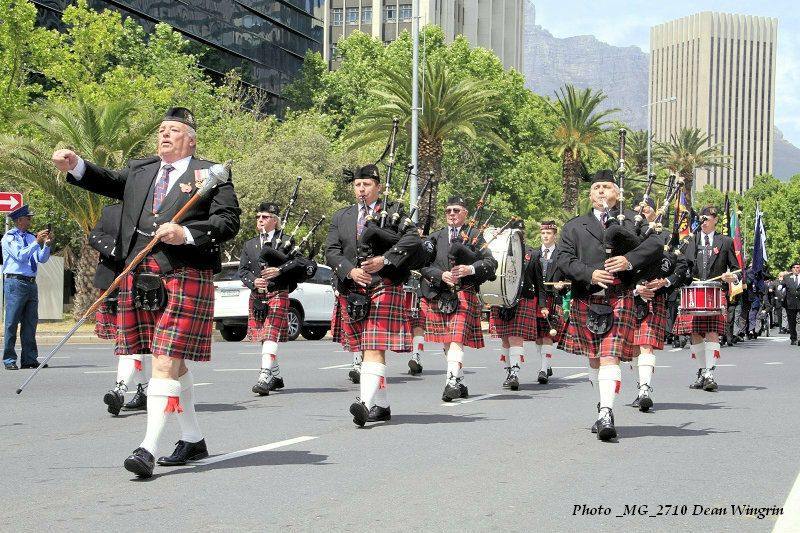 The City of Cape Town guard of honour consisted of members of the Traffic Services, Metro Police and Fire Brigade. 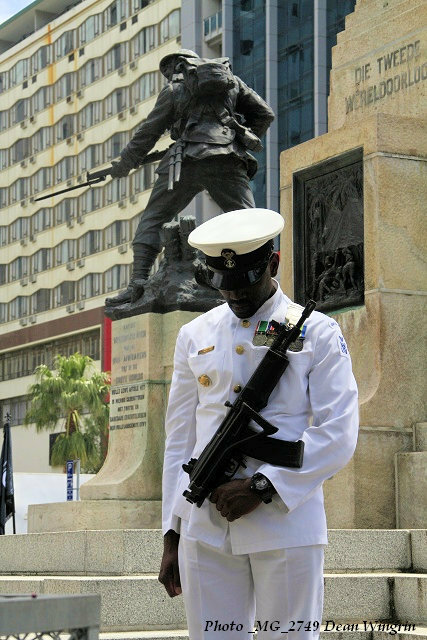 Rear Admiral Guy Jamieson (Deputy Chief of the SA Navy), representing the Chief of the SANDF. Major Charles Holloway (seated) and Seargeant Sidney Ireland (with cap). A pity the Army representatives were not wearing a formal dress uniform, their cammo looks 'sloppy' next to the formal uniforms of the Navy and Air Force. That is their formal dress. Only officers still have the "formal" or "step-outs" as we use to call them. Can anyone identify the medals worn by the Navy Petty Officer in the picture of Rear Admiral Guy Jamieson please? The guards are holding their rifles wrong. The correct position is like these Canadians. Wrong for who? 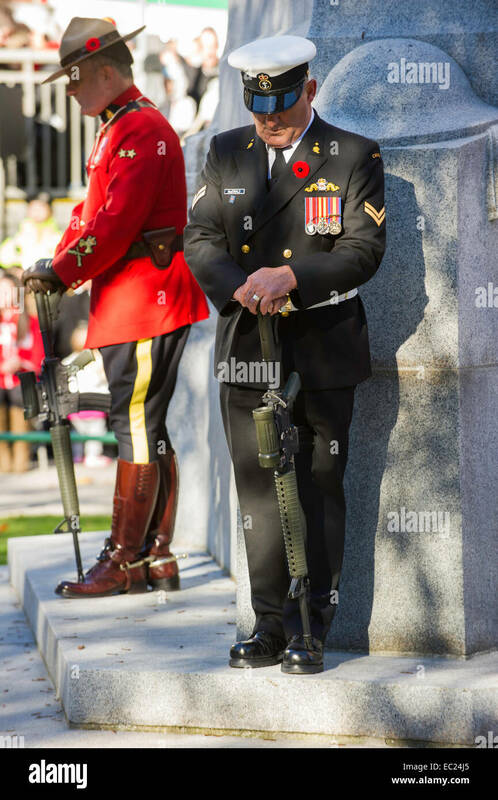 I have only seen the SANDF hold their rifles like in the photo, not how the Canadians do it. I suppose every defence force has their own way of doing it. I suppose our rifles are a bit to short to be held like that. The C16 is a much longer weapon. Good pictures Dean, it pleases me that this event is still commemorated in South Africa. 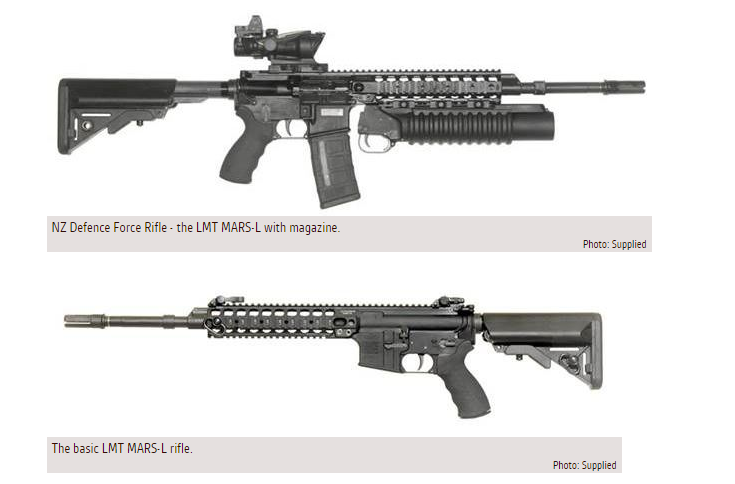 in turn is different to the Australians despite us using the same rifle.??? I would suggest the opposite. They are correctly formed up, squared off and their uniform is tidy.